A chilly morning in West Bragg Creek gilded all the tall grass and tree boughs with hoar frost emphasizing the hold winter now has on Kananaskis Country. I wandered around a few trails before finding this muscular stag walking steadily through a field. He watched me closely for a minute, pausing to check me over, before carrying on through the snow parallel to the path before crossing and bounding up the hill into the forest. 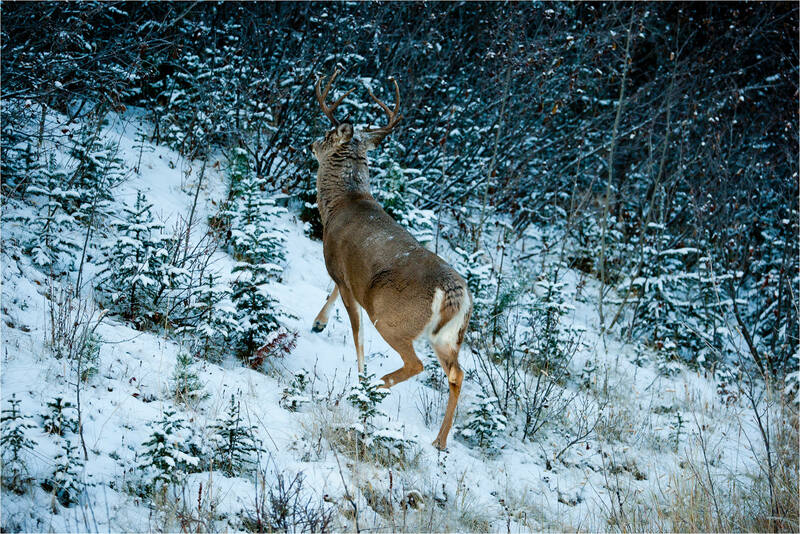 I encountered a second buck as I was heading back to Bragg Creek. I was driving on Township Road 232 and he was near the fenceline, partially obscured by a stand of reed-like branches. I was running a bit late and he seemed anxious so I only stayed for a minute to get this image before heading on my way. This entry was posted on November 22, 2011 by Christopher Martin. 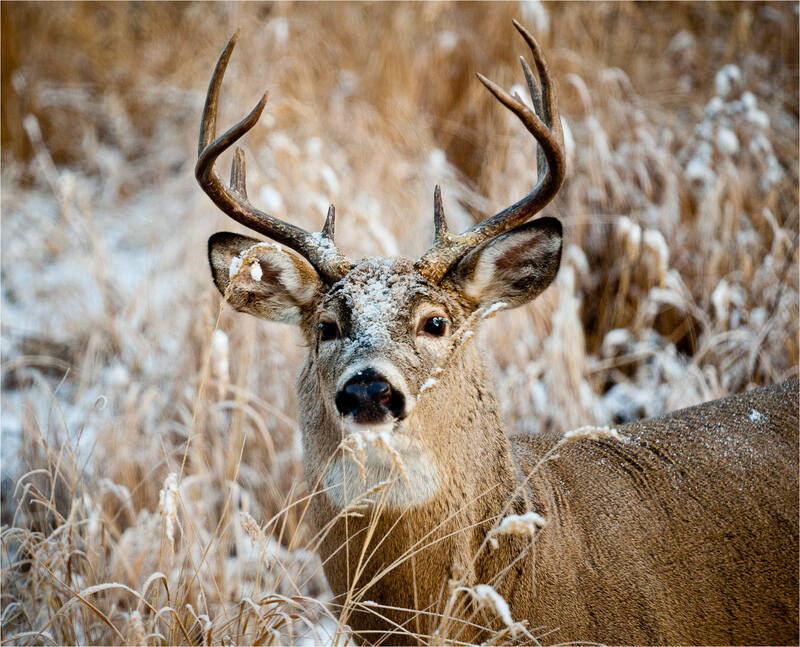 It was filed under Animals, Bragg Creek, Deer, Kananaskis and was tagged with antlers, buck, Odocoileus virginianus, stag, white-tailed deer, whitetail. Thank you for reading the blog and for commenting. All the best in your photography too. This is the kind of shooting I can appreciate:) Well done. 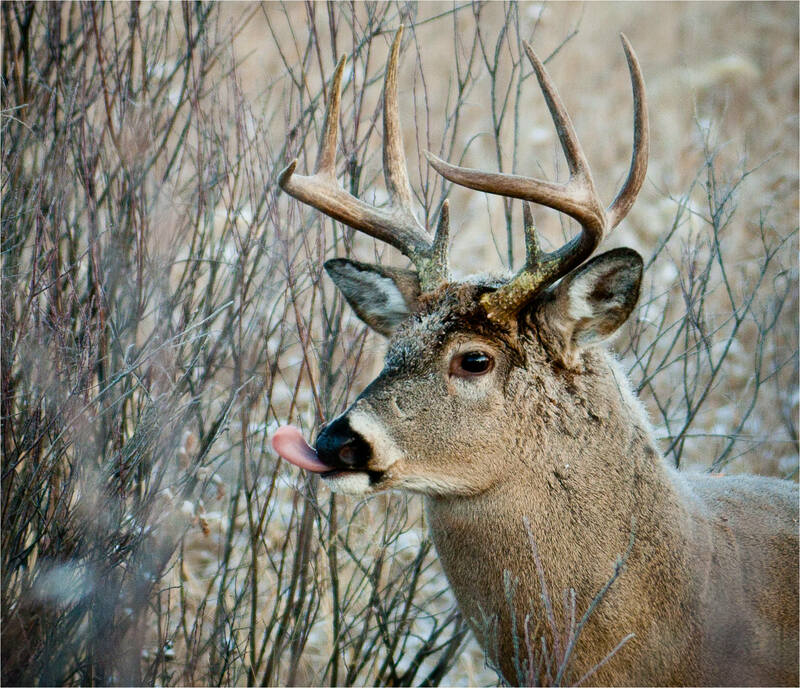 Love the shot of him licking his lips. Your photos made me think of Bambi’s dad. They are regal looking animals. Very picturisque. Thanks. Very nice pictures Chris. I think your website theme also helped increasing the viewing experience. It is perfect. Remarkable photos! Love the snowflakes on the eyelashes! . . . Congrats on being “Freshly Pressed”!! These are really gorgeous. I love the monochromatic treatment (although I know that has more to do with the season). What lens are you using? Hi Jessica – thanks for commenting. I used a Canon 70-200mm F/4 and a 300mm F/4 IS for these images. They are my standard wildlife lenses. I rent the 400mm F/2.8 and 500mm F/4 lenses when I can’t or don’t want to get too close. I will also use the two longer telephotos when I really want to separate the animals from their surroundings. Wow! Great captures! Congrats on an excellent post being FP’ed. Beautiful animal! I rarely see males, though the females slept in our yard a lot last year. Chris, congrats on being freshly pressed – well deserved! I’ve been following your blog for several months and always enjoy your photos. 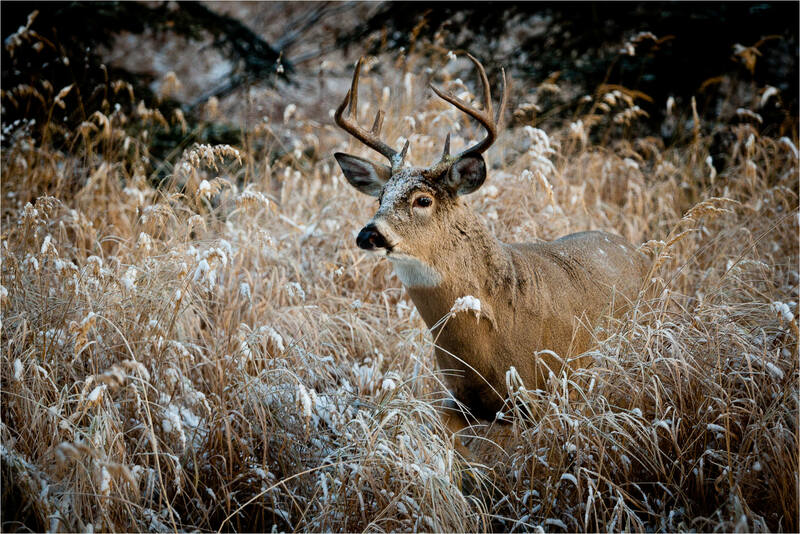 I love deer and these photos are absolutely beautiful! Beautiful. Nothing more to say! You should enter the ‘Wildlife Photographer of the Year’ competition at the Natural History Museum, London, with these shots. Really stunning and powerful. How perfectly camouflaged he is. The white fur on his throat mimics the white of the grasses behind him. His body color is the same as the background plants. You and Mother Nature: what a team! i like it so much thanks to share it !!!!!!!!!!!!! perfect picture!!! i like it…..
You can be very happy to get so close to it! This is Nice Blog and in Blog Very nice Pictures really i have not Words that how i described it. Looking too Pretty This Animal in Wildlife. great photos! How did you get so close without them being frightened? Some wonderful shots. The second and third ones are my favorites. You take wonderful pictures. Love you photos. Nice work, its nice to see a healthy young buck like that walking around in the snow. What great shots! Yes, you were very close to the animals, but I have had deer in Kananaskis come to within inches of me when I sit quietly. I’ve decided to follow your blog to see what else you will do. Love the pics. Awfully gorgeous. Beautiful atmospheric and great perspective ! Great shots! He looks as if he stuck his head in a snow bank with that bit of snow on his face. He also has some nice, thick fur to keep him warm this winter. I hope it’s not too bad of a winter for the animals! That’s a really nice closeup shot of the deer! Ooh the cute fluffy stag with snow on his face 😛 Really good pictures, but yes, i hope you weren’t as close to him as the pics appear! Very nice. Thank you for sharing these. A stunning collection – I’m ‘following’ as a result of seeing this. Now that’s the right way to “shoot” deer! Thanks for commenting – I could not agree with you more. How beautiful! I love your work. Magnificent photos of a magnificent animal. Muy buenas fotos, me gustan los venados o renos. Gracias Manuel – estos son los venados cola blanca. Estoy planeando viajar a Finlandia antes de renos fotografía. Beautiful photos! They give a great sense of season. Gorgeous shots. What a beautiful animal. TY for posting. Ditto all of the above compliments! Wow, these are stunning shots. Thanks so much for sharing and congrats on being freshly pressed! Very beautiful shots. Lucky you for these photographic treasures and congrats. on being Freshly Pressed. You are nearly a local to me..
Great photos! Makes me think of Bambi.. Thank you for your interest in using my images as a starting point. I’m happy to approve this usage. I have responded to your email directly with specifics. Beautiful animals, settings and photos; thanks, and good luck getting more. 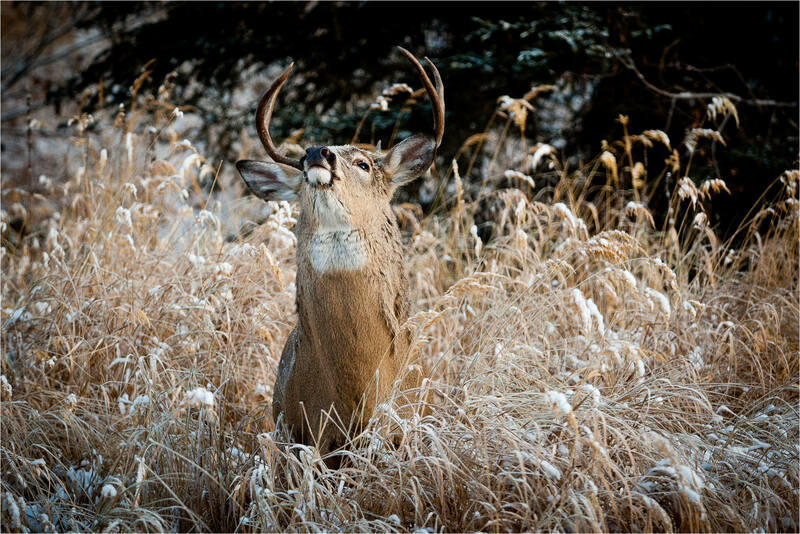 So beautiful and you truly captured the beauty of not only the stag, but of Kananaskis as well – one of the most beautiful places in Alberta! I almost hit one just like the third picture last night. Crazy. 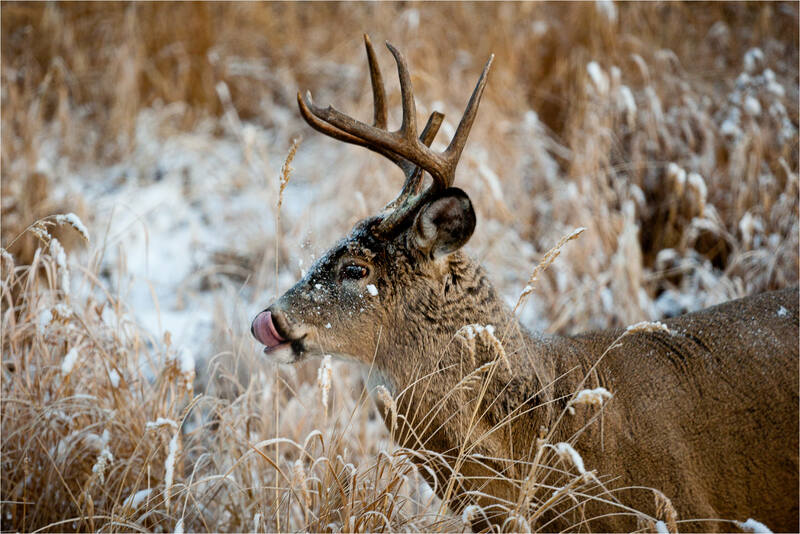 In two of the pics, it looks like the stags are sticking out their tongues. Is this normal behavior? Your photos are magnificent! I was recently on holiday in Italy, in the mountains, and came face to face with a deer, barely three feet away. We both had a shock, as we didn’t expect to bump into each-other in the deserted woods. Thanks for “shooting” the buck… haha, good one, right? Great photo and detail of a beautiful creature. These seriously look staged — so beautiful! Although it appears you were a bit close for (my) comfort … checking out that rack on his head, I’d be terrified he’d try to storm me! How close can you get to stags? I’d think they’re a bit aggressive, aren’t they? Lovely photos. Sorry I’ve not visited for a while. This was my question. Those horns look scary! Happy to see you back. I love your “Grape Fairy” image – very beautiful. I hope things are going well for you as we slide into winter. Regarding the stags, it is a poor idea to come close to the males when they are in rut. That has ended now in my part of the world so if you are cautious and take your time, the risk of them attacking is significantly reduced. I continue to spend a lot of time watching them, talking with others who know much more than I do and reading as much as I can on these and other local animal behaviours. When I meet up with wildlife, I usually take one or two quick pictures with a long lens from a fair distance and then see how the animal reacts. If they are calm, then I will usually walk parallel to them and see if that changes their mood. The ears and the eyes usually tell the story. With deer, the tails are a strong indication as well – up and they are wary, down and they are unconcerned (generally speaking). When it all comes together, I can end up with a moose or deer walking towards me and grazing on a bush just a few paces away. I’m not an expert but I have spent a lot of time studying several of the local animals so I feel comfortable in these situations. The obvious cautions are that wild animals are unpredictable and if a person hasn’t put the time in to learn about the animals beforehand, walking up to them is a very bad idea. I’m really happy when I can get close enough to use a shorter telephoto lens and then I try to show them within their environment – there is a different look from the long lenses where the animal fills the frame that I like for my images. A wonderful series and nice text. very nice images! It looks cold, too. Yes I agree, love it!